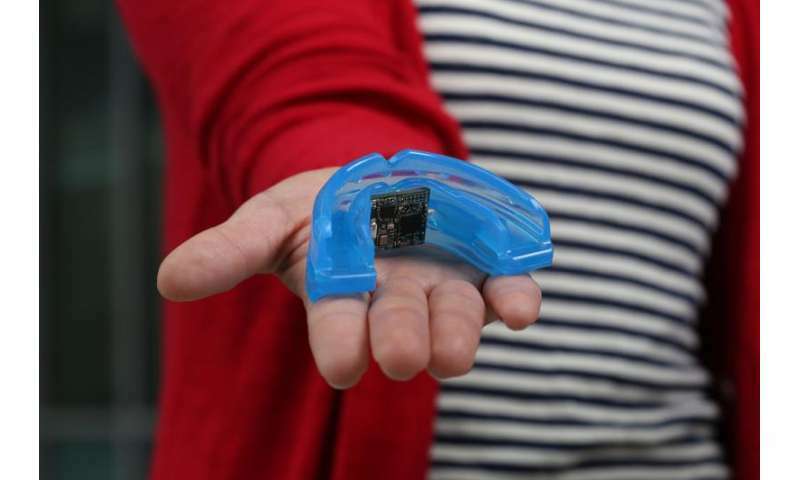 Engineers at the University of California, San Diego, have developed a mouth guard that can monitor health markers, such as lactate, cortisol and uric acid, in saliva and transmit the information wirelessly to a smart phone, laptop or tablet. The technology, which is at a proof-of-concept stage, could be used to monitor patients continuously without invasive procedures, as well as to monitor athletes' performance or stress levels in soldiers and pilots. In this study, engineers focused on uric acid, which is a marker related to diabetes and to gout. Currently, the only way to monitor the levels of uric acid in a patient is to draw blood. The team, led by nanoengineering professor Joseph Wang and electrical engineering professor Patrick Mercier, both from the University of California, San Diego, describes the mouth guard's design and performance this month in the journal Biosensors and Bioelectronics. "The ability to monitor continuously and non-invasively saliva biomarkers holds considerable promise for many biomedical and fitness applications," said Wang. In this study, researchers showed that the mouth guard sensor could offer an easy and reliable way to monitor uric acid levels. The mouth guard has been tested with human saliva but hasn't been tested in a person's mouth. Researchers collected saliva samples from healthy volunteers and spread them on the sensor, which produced readings in a normal range. Next, they collected saliva from a patient who suffers from hyperuricemia, a condition characterized by an excess of uric acid in the blood. The sensor detected more than four times as much uric acid in the patient's saliva than in the healthy volunteers. The patient also took Allopurinol, which had been prescribed by a physician to treat their condition. Researchers were able to document a drop in the levels of uric acid over four or five days as the medication took effect. In the past, the patient would have needed blood draws to monitor levels and relied instead on symptoms to start and stop his medication. Wang's team created a screen-printed sensor using silver, Prussian blue ink and uricase, an enzyme that reacts with uric acid. Because saliva is extremely complex and contains many different biomarkers, researchers needed to make sure that the sensors only reacted with the uric acid. Nanoengineers set up the chemical equivalent of a two-step authentication system. The first step is a series of chemical keyholes, which ensures that only the smallest biochemicals get inside the sensor. The second step is a layer of uricase trapped in polymers, which reacts selectively with uric acid. The reaction between acid and enzyme generates hydrogen peroxide, which is detected by the Prussian blue ink. That information is then transmitted to an electronic board as electrical signals via metallic strips that are part of the sensor. The electronic board, developed by Mercier's team, uses small chips that sense the output of the sensors, digitizes this output and then wirelessly transmits data to a smart phone, tablet or laptop. The entire electronic board occupies an area slightly larger than a U.S. penny. The next step is to embed all the electronics inside the mouth guard so that it can actually be worn. Researchers also will have to test the materials used for the sensors and electronics to make sure that they are indeed completely biocompatible. The next iteration of the mouth guard is about a year out, Mercier estimates. "All the components are there," he said. "It's just a matter of refining the device and working on its stability." Wang and Mercier lead the Center for Wearable Sensors at UC San Diego, which has made a series of breakthroughs in the field, including temporary tattoos that monitor glucose, ultra-miniaturized energy-processing chips and pens filled with high-tech inks for Do It Yourself chemical sensors. "UC San Diego has become a leader in the field of wearable sensors," said Mercier. Does high uric acid predispose diabetic patients to kidney disease? Put a touch sensitive surface on the tongue facing portion to make it useful for the people wearing it also. If this took the place of my mouse, I would be more willing to wear it.